The exhaust air valve body has a gasket made of circular foam gasket which prevents the false excess air from infiltrating inside a space from the sides, thus preventing possible contamination. Part of our air exhaust and supply air valves success story is our in-house fully Automatic Powder Coating Line. We have implemented the modern fully automatic painting line for the sole purpose of improving our production efficiency and painting quality. It serves our products such as the metal air valve along with other air distribution products like swirl diffusers. On top of that, our custom stamping parts benefit from our fully automated painting line as well. Any color is available upon request, with our current standard painting colors being RAL9010, RAL9016, RAL9003, RAL9006, etc. We have invested a significant portion of resources in our fully automated powder coating line. An investment that is already paying off tremendously as it enables us not only to improve the painting quality, but also to better control the lead time. 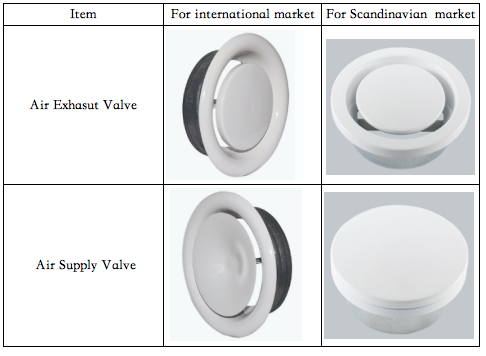 Our customers are very satisfied with our high painting quality combined with the short lead time, which is why the sales of our metal exhaust and supply air valves are growing very fast in the recent years. Please click HERE to visit our Air Valves product page and find out more about our solutions.